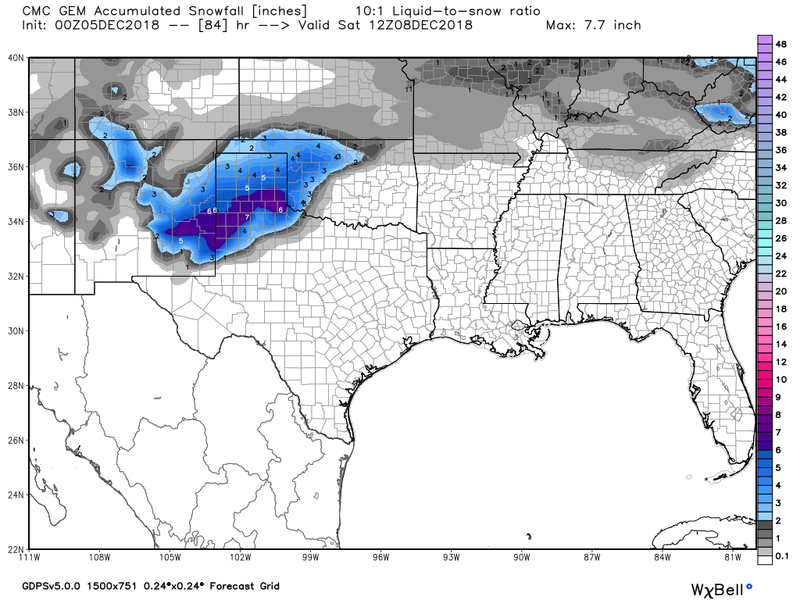 Models Now Forecasting A Significant Winter Storm Friday Into Saturday. Inn Of The Mountain Gods - Ruidoso, NM. 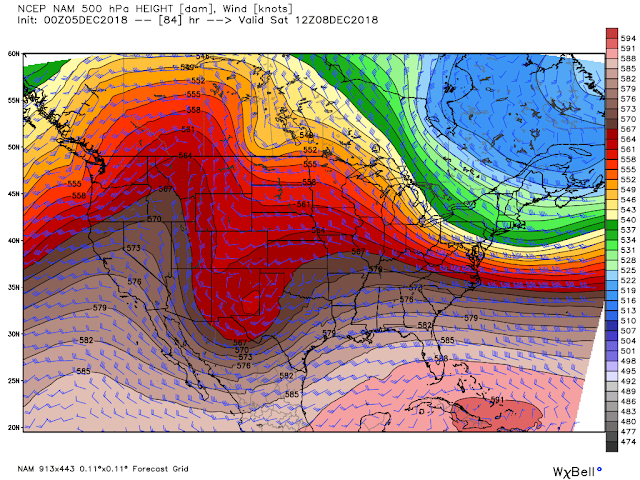 Significant Winter Storm Friday Into Saturday? NAM 500 Millibar/18,000' MSL Forecast. 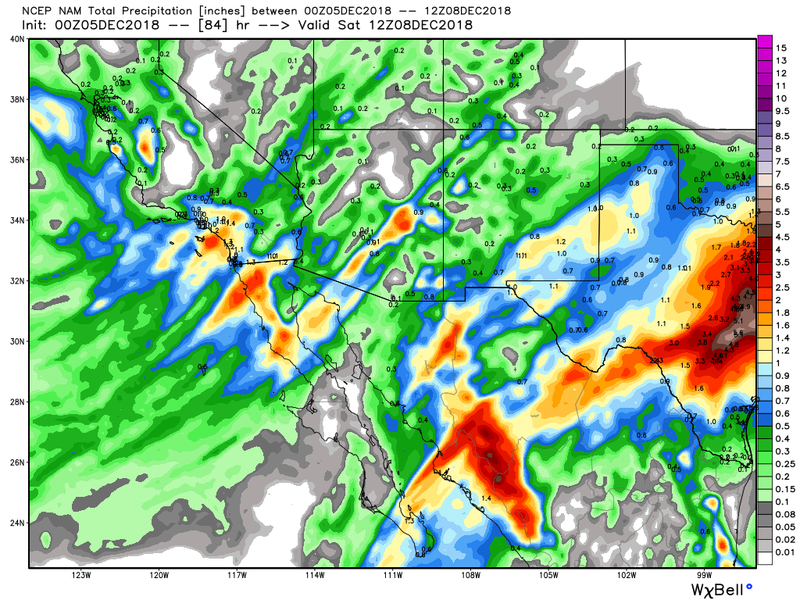 Valid At 5 AM MST Saturday. Tonight's 5 PM MST run of the NAM model forecasts a significant winter storm over the local area Friday into Saturday morning. By sunrise Saturday morning this model wants to try and form a closed low right over the top of Southeastern New Mexico. The GFS model has more of an open wave to our south. The NAM continues to be colder than the GFS also. The European now forecasts a mid-level trough centered near the Texas Big Bend by Saturday morning while the Canadian model drags a mid-level trough just south of El Paso by around midnight Friday. 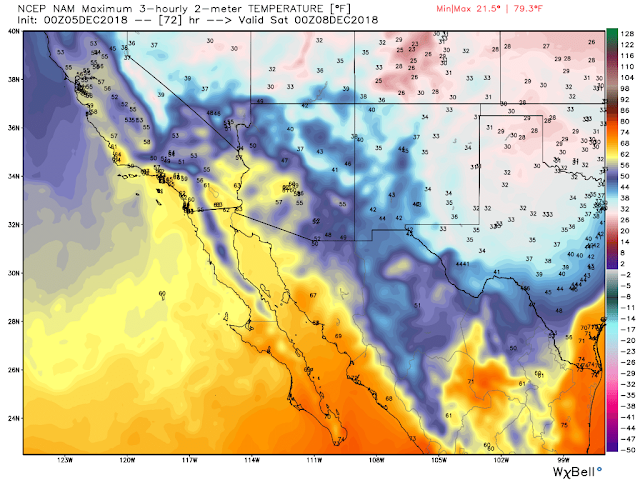 A shallow arctic cold front is forecast to backdoor into Southeastern New Mexico Thursday afternoon. How deep and cold this air mass is will have a huge impact upon what type of precipitation occurs over the area and in part how much. NAM Forecast High Temperatures Friday. Tonight's run of this model is forecasting high temperatures only in the low to mid 30's on Friday. Valid At 8 PM MST Friday. Valid At 11 PM Friday. 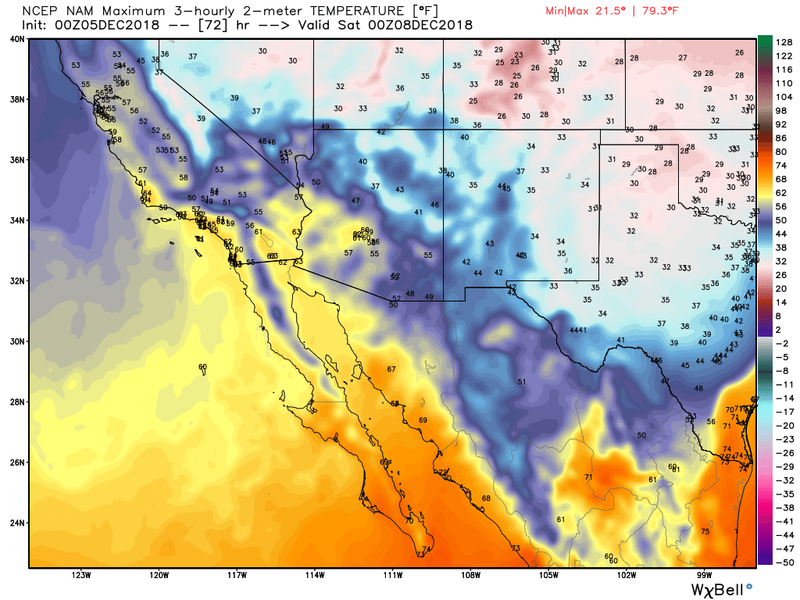 Valid At 2 AM MST Saturday. 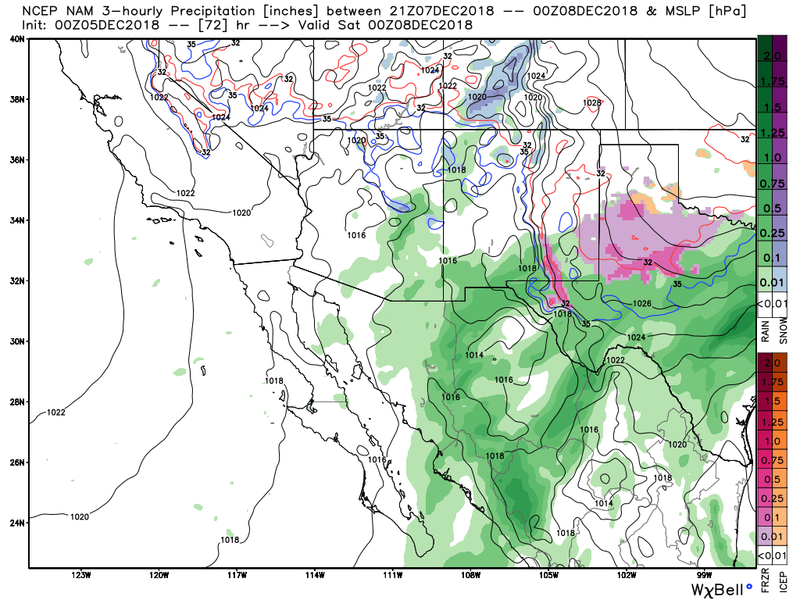 Tonight's run (Tuesday 5 PM MST) of the NAM model slows our incoming storm down and brings it in as a colder storm than the GFS model. So does tonight's European and Canadian models. Should these models forecasts verify this would have huge impacts upon our local weather Friday into Saturday. 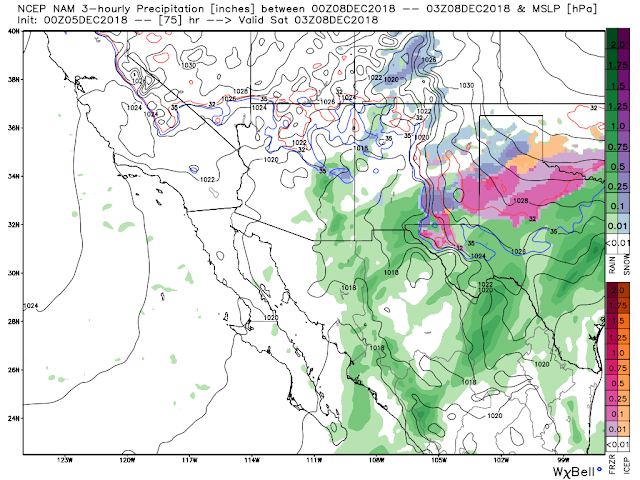 The NAM model holds the rain off until around noon on Friday then transitions over to a mix of rain and freezing rain over the local area by around sunset Friday. Then a heavy wet snow late Friday night into Saturday morning. NAM Storm Total Snowfall Amounts. 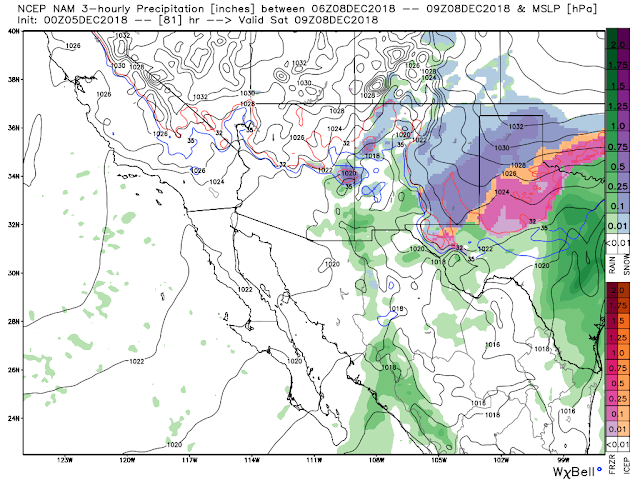 By around midnight the NAM model forecasts a mix of rain, freezing rain, sleet, and snow over the Southeastern Plains and nearby areas...transitioning over to heavy snow by sunrise Saturday. Total snowfall amounts get a little on the crazy side by Saturday with the following totals forecast by this model. Tonight's NAM Total Snowfall Forecasts. Clovis & Portales - 12"
NAM Storm Total Rainfall Amounts. By the time all of the rain falls and you include the melted snowfall this model forecasts a storm total over 1.00" to 1.50" over most of the local area come sunrise Saturday morning. The models are also hinting at enough instability in the atmosphere to produce a few thunderstorms out of this storm. So a few thundersnow storms could occur Friday night. Valid At 5 AM Saturday. Tonight's 5 PM MST run of the Canadian model (above) lends support to the NAM's thinking with a colder storm producing more snowfall than the GFS model. Although it does not get quiet as excited about the snowfall amounts as the NAM. Tonight's run of the European model is similar to the NAM's forecast for heavy snowfall locally. Tonight's ECMWF Total Snowfall Forecasts. Tonight's 5 PM MST run of the European (ECMWF) model is very similar to the NAM model in forecasting a wintry mix for Southeastern New Mexico Friday night into Saturday morning. 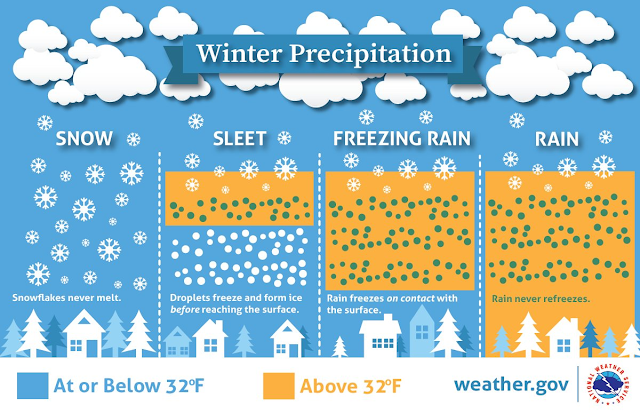 This includes rain changing over to freezing rain, sleet, and then heavy snow. 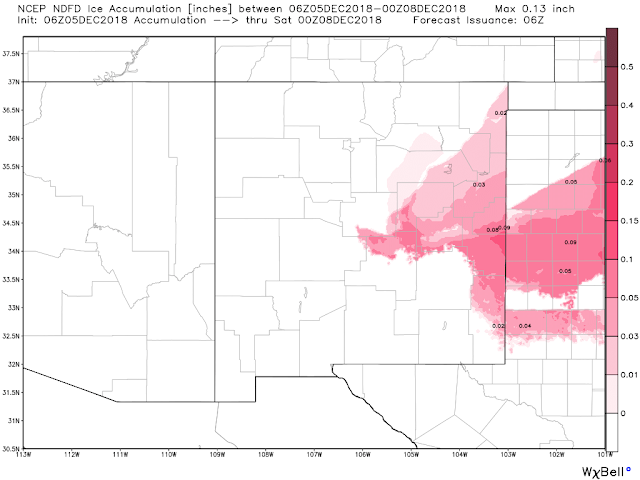 NWS NDFD Ice Accumulation Forecast. A ice storm is possible for parts of the local area (shaded in pink on the map above) Friday. 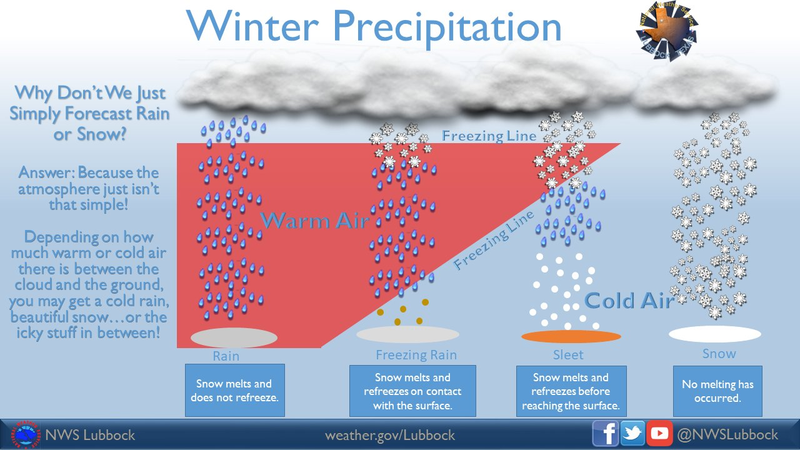 The Difficulty With Winter Type Precipitation Forecasting. There is no doubt that the computer forecast models have been struggling with the outcome of our next winter storm slated to begin affecting the state and local area on Thursday. Tonight's run of the NAM model goes hog wild with a significant winter storm with heavy rain, freezing rain, sleet, and finally heavy snowfall. Now the Canadian and European models join up with the NAM. Our local weather forecast remains messy at best as of this Tuesday night. The exact details of what type of wintry precipitation and how much are not certain yet. 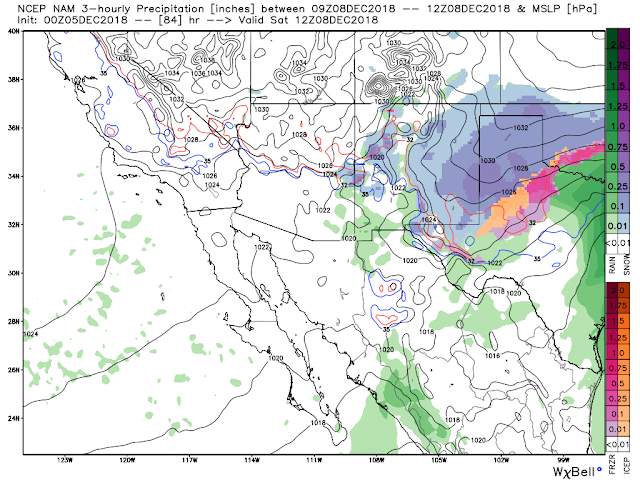 But the models continue to indicate that this incoming storm will have significant wintry weather impacts upon the state and local area Thursday night into Saturday morning. 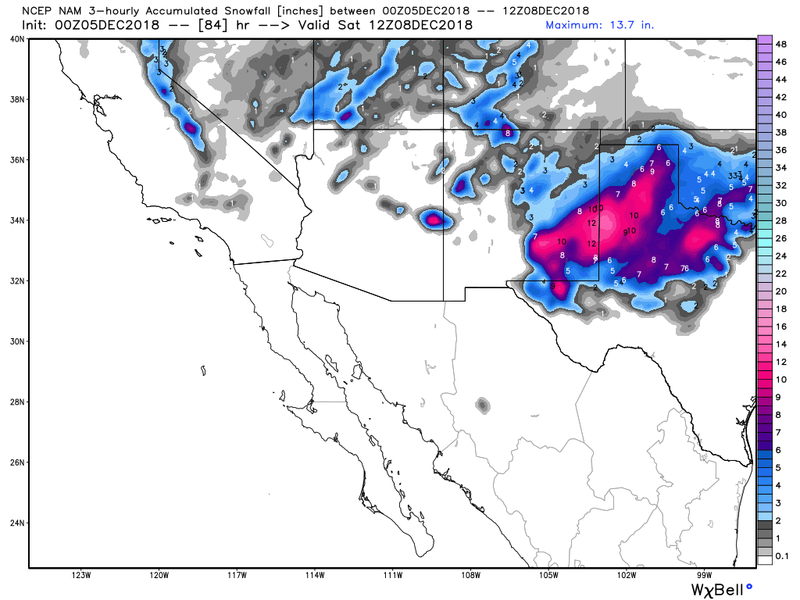 With the latest run of the European (ECMWF) just coming in we now have three models forecasting a significant winter storm for Eastern and Southeastern New Mexico and parts of West Texas from Friday afternoon into Saturday morning. 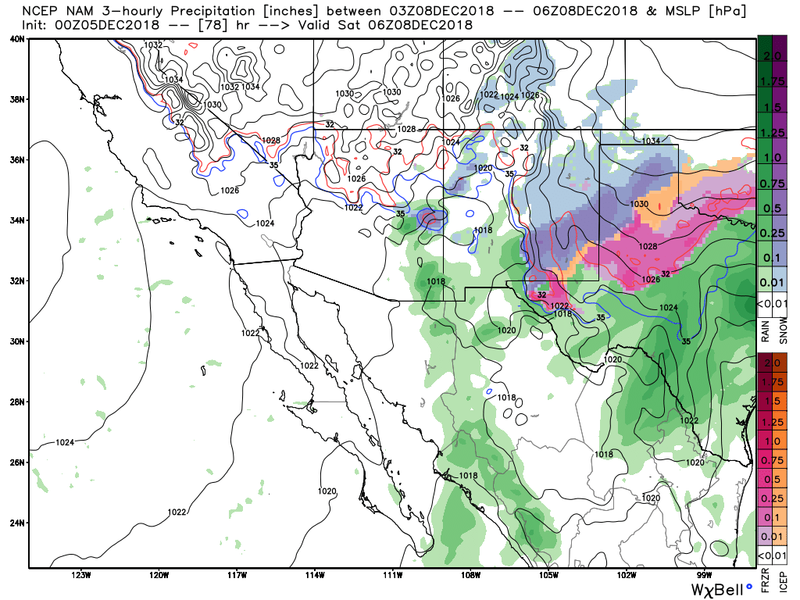 The European, the Canadian, and the North American Model (NAM) all forecast a wintry mix of rain, freezing rain, and sleet beginning Friday afternoon changing over to a heavy wet snow late Friday night into Saturday morning. At the very least a cold rain with perhaps a few thunderstorms seems likely starting possibly as early as Thursday night continuing into Saturday morning. There is a chance that locally we could see this cold rain mix with or change over to freezing rain, sleet, and snow. How much, where, and for how long just isn't settled yet. At the worst a significant ice and snow storm could be shaping up to affect the local area Friday night into Saturday with travel problems widespread over the area.